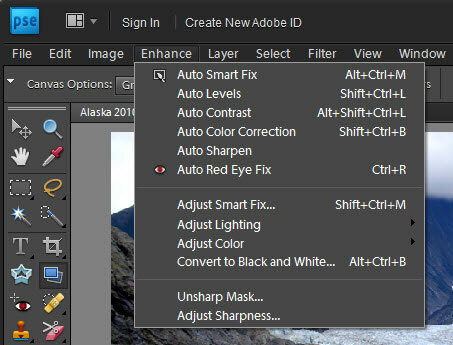 Photoshop Elements has five automatic lighting-, contrast-, and color-correction tools that can improve the appearance of your images with just one menu command. These commands are available in either Edit Full or Edit Quick mode, and they’re on the Enhance menu. You’ll also find them in the Organizer (under the Fix pane), where you can apply them to several images at once. The advantage of these one-step correctors is that they’re extremely easy to use. You don’t need to have one iota of knowledge about color or contrast to use them. The downside to using them is that sometimes the result isn’t as good as you could get via a manual color-correction method. The Auto Fix tools are available on the Enhance menu. Usually, you don’t want to use more than one of the auto fixes. If one doesn’t work on your image, undo the fix and try another. This all-in-one command is touted to adjust it all. It’s designed to improve lighting, improve the details in shadow and highlight areas, and correct the color balance. 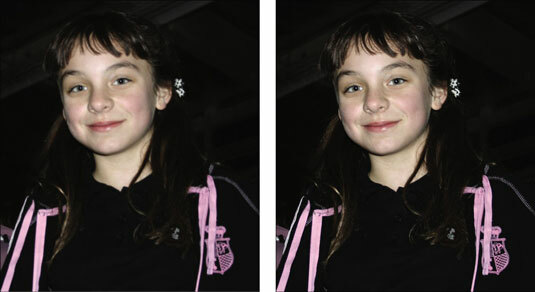 In the following figure, the overexposed image on the left was improved quite nicely with the Auto Smart Fix command. Apply the Auto Smart Fix command to quickly improve an image. If the Auto Smart Fix was just too “auto” for you, you can crank it up a notch and try Adjust Smart Fix. This command is similar to Auto Smart Fix but gives you a slider that allows you, not Elements, to control the amount of correction applied to the image. The Auto Levels command adjusts the overall contrast of an image. This command works best on images that have pretty good contrast (even range of tones and detail in the shadow, highlight, and midtone areas) to begin with and need just a minor amount of adjustment. Auto Levels works by mapping, or converting, the lightest and darkest pixels in your image to black and white, thereby making highlights appear lighter and shadows appear darker. Auto Levels adjusts the overall contrast of an image. Although Auto Levels can improve contrast, it may also produce an unwanted colorcast (a slight trace of color). If this happens, undo the command and try the Auto Contrast command instead. The Auto Contrast command is designed to adjust the overall contrast in an image without adjusting its color. This command may not do as good a job of improving contrast as the Auto Levels command, but it does a better job of retaining the color balance of an image. Auto Contrast usually doesn’t cause the funky colorcasts that can occur when you’re using Auto Levels. The Auto Contrast command works wonders on hazy images. The Auto Color Correction command adjusts both the color and contrast of an image, based on the shadows, midtones, and highlights it finds in the image and a default set of values. These values adjust the amount of black and white pixels that Elements removes from the darkest and lightest areas of the image. You usually use this command to remove a colorcast or to balance the color in your image. Occasionally, this command can also be useful in correcting oversaturated or undersaturated colors. Use Auto Color Correction to remove a colorcast. Photos taken with a digital camera or scanned on a flatbed scanner often suffer from a case of overly soft focus. Sharpening gives the illusion of increased focus by increasing the contrast between pixels. Auto Sharpen attempts to improve the focus without overdoing it. What happens when you oversharpen? Your images go from soft to grainy and noisy. For more precise sharpening, check out the Unsharp Mask and Adjust Sharpness features. Always make sharpening your last fix after you make all your other fixes and enhancements. Use Auto Sharpen to improve focus. This command is self-explanatory. 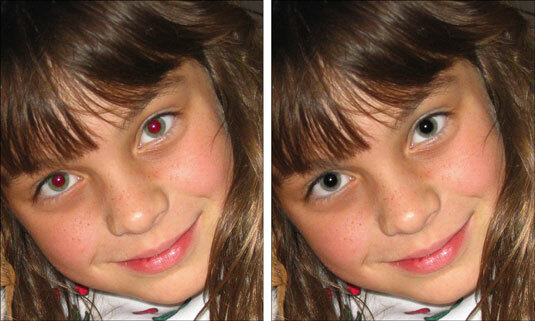 The Auto Red Eye Fix command automatically detects and eliminates red-eye in an image. Red-eye happens when a person or an animal (where red-eye can also be yellow-, green-, or even blue-eye) looks directly into the flash. Select the Red Eye Removal tool from the Tools panel. This tool darkens the pupil while retaining the tonality and texture of the rest of the eye. The Auto Red Eye Fix and the Red Eye Removal tool fix the dreaded red-eye.